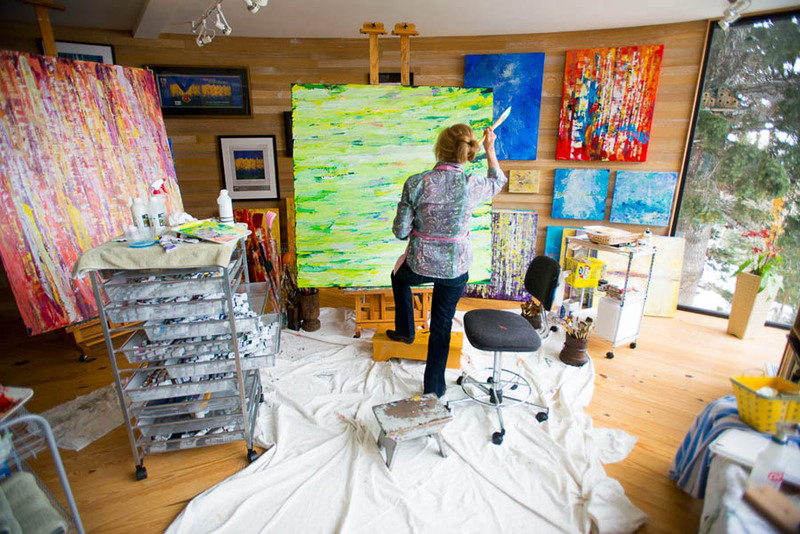 Susan Swartz in her Park City studio. "For Susan Swartz's many fans in Park City, it has been thrilling to watch her heady ascent from local artist in the early 1990s to national and international star..." Thus begins Park City Magazine's feature of Susan in their Summer/Fall 2013 issue just out today. Written by Wendy Lavitt, "True Colors" details much of Susan's artistic journey since moving to Utah. Susan was honored to support the Divinity School at Harvard University by sponsoring the February 28th panel about the barriers facing women hoping to work within Shari’a law courts. Titled “Women’s Rights in a Man’s World,” the panel featured Kholoud Al-Faqih, the first female judge in a Palestinian Shari’a court, as well as several other notable female law leaders. As residents of one of the healthiest counties in the nation, it can be easy for Susan’s Park City neighbors to forget that a true health crisis — an epidemic of obesity and related diseases is rolling across the nation. But, as someone who has struggled for years with the effects of chronic illness, Susan places enormous weight and value on holistic health. Which is why she is especially excited to announce a joint venture between the Christian Center of Park City, Jewish Family Services, The People’s Health Clinic, and Intermountain to host a talk with bestselling author and international speaker, Dr. Mark Hyman. Susan hopes that you will join her on Wednesday, March 6, starting at 7:00pm at Temple Har Shalom in Park City for Dr. Hyman’s talk entitled "Expand Your Brain, Shrink Your Belly: The Secrets to Boosting Your Brain Power and Losing Fat and Staying Healthy For Life." Dr. Hyman is the pioneer of an advancing field called functional medicine which views the human body as an integrated system and looks to identify and address the root causes of disease — not just treat the symptoms. This family physician and four-time New York Times bestseller will focus his upcoming talk on chronic disease prevention through nutrition, diet and exercise. As an artist, Susan spent years painting the grandeur and serenity of the natural world. When she became desperately ill with environmentally-bred diseases, Susan saw the fragility of nature. So too for me. As a photographer for National Geographic I was able to catalogue the beauty of our planet for two decades. As a diver for that same period of time, I was able to bear witness to its degradation. It is from this perspective that I, along with a close group of like-minded activists, formed the Oceanic Preservation Society (OPS). Nobody could have predicted the success of our first endeavor, the Academy Awardâ winning film The Cove, but there was never any question of its importance. Susan saw the truth in our story right away, and became a champion of OPS and a supporter of our films. I cried over beautiful things knowing no beautiful thing lasts.